The October issue of the EATCS Bulletin is now available online at http://www.eatcs.org/beatcs/index.php/beatcs/issue/view/10. You can download a pdf with the printed version of the Bulletin from http://www.eatcs.org/images/bulletin/beatcs111.pdf. This is issue number 111 of the BEATCS and is the first one edited by Kazuo Iwama, the new editor in chief of the EATCS. Apart from four EATCS columns, including the first one edited by Giovanni Pighizzini, this issue of the Bulletin also features contributions by Erik Demaine (recipient of the Presburger Award 2013), by Luca Moscardelli (recipient of the first Young Researcher in Theoretical Computer Science Award of the Italian Chapter of the EATCS) as well as by Jacopo Mauro and Alessandra Scafuro (recipients of the two Best Italian Ph.D. Thesis in Theoretical Computer Science Awards for 2013 of the Italian Chapter of the EATCS). And I have not yet mentioned the conference reports and the contributions related to EATCS matters, amongst which the calls for nominations for several EATCS awards and fellowships. I hope that you will enjoy this issue of the Bulletin. Of course, Kazuo and I welcome suggestions for improving the BEATCS. Feel free to drop us a line with your ideas and desiderata. The call for nominations for the EATCS-IPEC Nerode Prize 2014 for outstanding papers in multivariate algorithmics is out. The award committee consists of Georg Gottlob (Oxford University), Jan Arne Telle (University of Bergen) and Peter Widmayer (ETH Zurich, chair). Do make their job hard by nominating your favourite eligible papers! Today, the dean of my school shared a well-written article by Tara Brabazon entitled "10 truths a PhD supervisor will never tell you". Here it is, for your reading pleasure. "Time is finite. Bureaucracy is infinite." "If the prospective supervisor needs a personality replacement, lacks the life skills to manage a trip to the supermarket or requires electronic tagging so that he (or she) does not sleep with the spouses of colleagues, then make another choice. Supervisors should be functional humans." The comments to that article offer a valuable counterpoint to the "ten truths" and are well worth reading too. Nati Linial. Locality in Distributed Graph Algorithms. SIAM Journal on Computing, 21(1), pages 193-201, 1992. See also here. You can read the official award citation here. Congrats to Nati Linial and to the award committee for an excellent choice. The June 2013 issue of the Bulletin of the EATCS is now available as a single PDF file and from the open journal system. With this issue, we say goodbye to Maria Serna, who has been the editor in chief of the BEATCS for the last five years, editing 15 issues of the Bulletin. As current president of the EATCS, I warmly thank Maria for all the hard work she has put into the challenging task of editing the BEATCS while taking care of all her other duties. Her efforts were way beyond the call of duty. From the October 2013 issue, the BEATCS will be edited by Kazuo Iwama. I wish Kazuo the best of luck in this new role and look forward to working with him. If you have any suggestion on how to improve the quality of the BEATCS even further, feel free to contact Kazuo or me, or simply post your suggestions as comments to this blog post. At long last, the EATCS has a YouTube channel. (Thanks to the EATCS Secretary office in Patras for setting it up and for making us enter the 21st century :-)) In due course, the videos of the invited talks and of the EATCS-Award-2013 presentation by Martin Dyer from ICALP 2013 will be available from that channel. For the moment, you can enjoy Erik Demaine's wonderful Presburger Award 2013 video. Make sure that you subscribe to the channel to get updates on our postings. The slides for Jon Kleinberg's inspiring EATCS lecture are available here. Several people asked me for the slides and Jon agreed to make them public. Thanks Jon! Conference photos taken at ICALP 2013 can be found here. Enjoy. The CAV Award for 2013 has been presented to Kim G. Larsen, Paul Pettersson and Wang Yi for their seminal work on Uppaal, which is the foremost tool suite for the verification of real-time systems and the synthesis of real-time controllers. Congratulations to the awardees for receiving this well deserved accolade and to the award committee for making such an excellent choice! If you are interested in using the tool for research and/or teaching, simply download it and read this tutorial by Frits Vaandrager. You will be up and running in no time. Uppaal has its roots in a tool originally developed in Uppsala and described in the conference paper Automatic verification of real-time communicating systems by constraint-solving co-authored by Wang Yi, Paul Pettersson and Mads Daniels (Proceedings of FORTE 1994). Since then, Uppaal has been jointly developed by Kim G. Larsen's research group at Aalborg University and by the group led by Wang Yi at Uppsala University. In this period, Uppaal has become an industrial-strength tool for computer-aided verification of computing systems that has been applied to many case studies by several research groups in academia and industry. The efficiency of its computational engine has been improved greatly by theoretical and practical advances relying on highly non-trivial insights. Moreover, the tool now supports the analysis of quantitative extensions of timed automata, automatic model-based testing of real-time systems and the synthesis of controllers in the context of timed games. It is still under continuous development. Overall, the Uppaal tool is a real success story for the research community working on automated verification of computer systems. As all long-term research and tool development efforts, the work on Uppaal and its applications is due to many gifted researchers and their students. The CAV Award 2013 cannot recognize them all, but the list of authors of the many papers stemming from the work on UPPAAL gives a hint of the magnitude of the research effort involved in building such a tool over a period of nearly 20 years. The best paper award session at ICALP 2013 was held last Monday before the welcome reception (which included excellent, and plentiful, finger food and wine). Mark Bun, John Fearnley and Dominik Pajak delivered very good presentations of the award-winning papers. I hope that you will check out their papers. In the case of the paper by Mark and Justin Thaler, you can also read this expository blog post. He then proceeded to give an accessible historical overview of what he did do, covering essentially all the work mentioned in the laudatio for the award. Last, but by no means least, Tony Kucera presented the Presburger Award 2013 to Erik Demaine. Unfortunately, Erik could not be with us in Riga, but we had a virtual presentation of the award to him via Skype. Moreover, Erik produced an excellent video of a presentation that we could play and enjoy at the conference. Rather than attempting to summarize Erik's inspirational talk, I will simply limit myself to letting him speak for himself. ICALP 2013 in Riga featured five invited presentations and a special EATCS lecture to celebrate the 40th edition of the ICALP conference. The scientific program for the conference was preceded by short presentations by the rector of the University of Latvia and by Rusins Freivalds. The rector welcomed the ICALP participants, gave us some interesting information about the University of Latvia and wished us long coffee breaks. Rusins discussed the unity of science, and reminded us that, even at the time of the iron curtain, there was one Computer Science. The conference proper was kicked off on Monday, 8 July, by an invited talk delivered by the Liverpool-bound Paul Spirakis. Paul's talk was entitled A Guided Tour in Random Intersection Graphs. Random Intersection Graphs are random graphs in which there is a universe M of labels and each one of the vertices selects a random subset of M. Two vertices are connected if, and only if, their corresponding subsets of labels intersect. Random intersection graphs were introduced by M. Karonski, E.R. Sheinerman and K.B. Singer-Cohen and have several applications, as well as a rich theory. Paul's talk provided a survey of the main results on the topic obtained by his research group on combinatorial problems over random intersection graphs, such as independent sets, Hamiltonian cycles, colouring, maximum cliques, expansion and random walks. Paul closed the talk by saying that this model is an excellent area of study for PhD students in TCS. Tuesday's invited address was delivered by Daniel Marx. Daniel's talk has three chapters (his words) and was entitled The Square Root Phenomenon in Planar Graphs. Its starting point was the observation that most of the classic NP-hard problems remain NP-hard when restricted to planar graphs, and only exponential-time algorithms are known for the exact solution of these planar problems. However, in many cases, the exponential-time algorithms on planar graphs are significantly faster than the algorithms for general graphs: for various problems on planar graphs, one often sees a square root appearing in the exponent of the running time of the best algorithms for their solution. Daniel told his audience that, by now, we have a good understanding of why this square root appears: most of these algorithms rely on the notion of treewidth and its relation to grid minors in planar graphs. Daniel also argued that, under the Exponential Time Hypothesis, one can show that these algorithms are essentially best possible, and therefore the square root must appear in the running time. In passing, Daniel contributed also one paper to ICALP Track A and one to ICALP Track B! Susanne Albers delivered the invited talk on Wednesday, 10 July, on Recent Advances for a Classical Scheduling Problem. In her talk, Susanne revisited the classic on-line makespan minimization problem, which has been studied since the 1960s. After presenting the classic results on this problem, starting from Graham's 1966 List algorithm and its competitive analysis, she surveyed recent research on settings in which an online algorithm is given extra information or power while processing a job sequence. The scientific programme on Thursday, 11 July, started with an invited talk by Orna Kupferman, who gave the only invited address that could be readily classified as belonging to ICALP Track B. Orna's presentation dealt with Formalizing and Reasoning about Quality. Traditionally, formal approaches to the verification of reactive systems are boolean in nature: either a system satisfies its specification or it doesn't. In case a system does not meet its specification, one expects a good verification framework to provide a counter-example, that is, a reason why the system is not correct. Orna and her co-authors have generalized formal specification and verification methods to address the quality of systems. In her talk, Orna introduced the linear temporal logic LTL[F], where F is a set arbitrary functions over the interval [0, 1]. Formulae in LTL[F] are interpreted over computations consisting of sequences of atomic propositions. The satisfaction value of an LTL[F] formula is a number between 0 and 1 that describes how well a computation satisfies a formula. The logic generalizes traditional LTL with the functions in F; examples of functions that might be in F are the maximum or minimum between the satisfaction values of subformulas (these are the quantitative counterparts of boolean OR and AND, respectively), their product and their average. In her talk, Orna showed us how to generalize classic decision problems in formal methods, such as satisfiability, model checking and synthesis, to search and optimization problems in the quantitative setting. This is achieved by means of an extension of the automata-theoretic approach to LTL to the setting of LTL[F]. Before the conference dinner, Jon Kleinberg delivered a special EATCS lecture to celebrate the 40th ICALP. Jon gave an inspiring and very articulate talk entitled Algorithms, Networks, and Social Phenomena. The talk discussed the development of computational models for systems involving social networks and large human audiences. In particular, Jon focused on how information spreads through such systems, and the ways in which this spread is affected by the underlying network structure. Jon said a few times that, despite having so much data at our disposal, we still do not understand human behaviour. However, IMHO, the work by Jon and his coworkers is shedding some light on some aspects of our behaviour. Peter Widmayer delivered the last invited talk on Friday, 12 July. His presentation was entitled To Be Uncertain Is Uncomfortable, But to Be Certain Is Ridiculous, and was accessible and well paced. The starting point of Peter's talk was a "Socratic dialogue" between a statistical physicist and himself. Traditionally, in combinatorial optimization one assumes that an input instance is given with absolute certainty. The goal is then to find an optimum solution for the given instance. In contrast, as the statistical physicist would argue, input data are in reality uncertain, noisy and inaccurate. As a consequence, an optimum solution to a combinatorial optimization problem might not be meaningful in practice. (For example, the shortest path to our work place we computed yesterday evening might not be usable this morning because of changed traffic conditions.) Peter advocated the development of algorithms that find "meaningful" solutions in the presence of uncertain inputs, proposed an approach towards reaching this goal. and argued that it leads to good solutions in the real world. Videos of these talks (with the exception of Kleinberg's talk, which, as far as I know, was not recorded) will be available in due course. ICALP 2013 has just finished. It has been an action packed conference and there has been next to no breathing space. I think that the conference was a great success and the organizers deserve our most heartfelt thanks for all their work. In case you do not know, the conference has being held in Riga at the University of Latvia. This has been the first time that ICALP has been organized in a country of the former Soviet Union and this was the 40th edition of the ICALP conference. First of all, kudos to the local organizers, who did their very best to make the conference a festive occasion and a very pleasant experience for all the attendees. The city of Riga is very pretty and all ICALP participants had a very warm welcome. The University of Latvia was also enrolling a new batch of students during ICALP and this meant that there was a continuous flow of young and happy-looking people on the university premises. This made the main hall of the university a very lively place to be. We were also blessed with sunny and warm weather, which also helped (especially coming from rainy Iceland). According to the data presented by Agnis Škuškovniks, on behalf of the organizing committee, to the EATCS council and to the EATCS general assembly, there were 193 registered participants in ICALP 2013, of which 67 are students. Including the local participants, the six invited speakers and the two recipients of the honorary doctorates awarded on Tuesday (Josef Gruska and Juris Hartmanis), 217 people attended ICALP 2013. The pre-conference workshops were attended by 102 participants, which is a very healthy number. The honorary doctorates were an excellent addition to the standard session devoted to the EATCS Awards. Gruska and Hartmanis delivered lucid and inspirational presentations. It was truly awesome to see Juris Hartmanis deliver an off-the-cuff speech on how he left Latvia and ended up at Cornell as chair of the newly-funded CS department. At 85, he is very articulate and sharp. I had the pleasure of discussing several subjects with him during a very pleasant dinner arranged by the organizers. He is still a truly inspirational figure. Here are some quick EATCS- and ICALP-related news. ICALP 2014 will be held in Copenhagen, Denmark, immediately after SWAT 2013. It will be a four-day ICALP and the general chair for the conference is Thore Husfeldt. ICALP 2015 will be held in Kyoto, Japan, and will be co-located with LICS 2015. Kazuo Iwama is the ICALP 2015 general chair. This will be the first ever ICALP outside Europe. The EATCS will soon announce and EATCS Fellows programme. The first deadline for nominations will be at the end of this year and we plan to make the first announcement of fellows at ICALP 2014 in Copenhagen. The EATCS will begin a new EATCS Young Researcher School Series from 2014. The first school in the series will be organized by Tony Kucera in a beautiful location in Moravia in late July/early August. The theme of the school will be "Automata, Logic and Games". Orna Kupferman gave a thought-provoking talk on "The Gender Challenge in TCS" at the EATCS General Assembly. It really got the audience thinking about this important matter. In case you are interested in having a look, the slides I used for the EATCS general assembly, where the above decisions where made or communicated, are here. In a subsequent post, which I will write when I get home, I will try to discuss some of the many scientific highlights at ICALP 2013. To conclude, at the conference I heard that Paul Spirakis is moving to the University of Liverpool. Good luck to Paul! I have been asked to advertise this position, which might be of interest to several of my readers and their graduating PhD students/postdocs. The Language Based Technology section of DTU Applied Mathematics and Computer Science has a new opening for associate and/or assistant professors. modelling, analysis and realisation of systems using language-based techniques and tools. Our current expertices include static analysis and model checking and take place in a number of research centres and research projects (MT-LAB, IDEA4CPS, TREsPASS, FutureID, SESAMO, PaPP). We are interested in concurrent, distributed and mobile systems where reliability and predictability are essential and hence properties related to safety, security and performance are of key interest; the systems may include considerations of socio-technical nature within Systems of Systems. The School of Computer Science at Reykjavik University has, at long last, created its own YouTube channel. See https://www.youtube.com/user/rucomputerscience. We are uploading videos of talks from season one of our Pearls of Computation seminar series and from last year's Alan Turing Year events, as well as other material that might be of general interest. In case you are interested in following the events we organize, I'd be grateful if you could spend approximately 5 seconds to open the page and click "Subscribe". Thanks in advance! I would like to have some blog coverage for ICALP 2013. If you are attending the 40th ICALP in Riga and you are interested in guest blogging, drop me a line. Ideally, I would like to have a guest blogger for each of the tracks in the conference. You are, of course, also most welcome to blog about the five invited talks and the award ceremonies. I have been asked to distribute this call for applications for PhD positions in a newly founded international PhD School in Italy, the Gran Sasso Science Institute. I hope that you will encourage some of your best students to apply. We are particularly interested in attracting foreign students. So it would be great if you can deliver this announcement through your emailing lists in your countries. The deadline for applying to the program is 15th july. Students will be offered free housing and meals plus the standard three years PhD grant. The official language is English. GSSI is a new initiative that is starting in L'Aquila as a consequence of the redevelopment plan after the earthquake. The school is managed by INFN (http://www.infn.it/index.php?lang=en) and will start a PhD program in Computer science that is centered around new generation computing, including distributed, ubiquitous and autonomous systems, with emphasis on three main disciplinary pillars: algorithms, software engineering and specification and analysis. 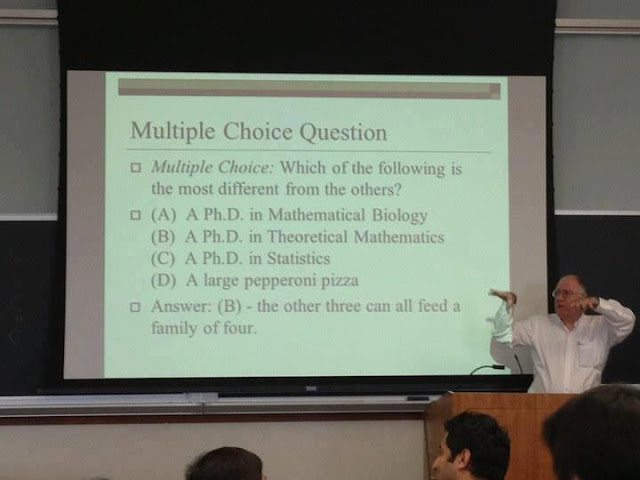 (http://www.lngs.infn.it/), and another in Mathematics centered around mathematical modeling. (http://www.sissa.it/), and Scuola Superiore S. Anna in Pisa for urban studies (www.sssup.it <http://www.sssup.it/> ). Thank you in advance for your attention and your support. for their contributions to cryptographic concepts and schemes that provide greater efficiency, flexibility, and security. These papers established the field of pairing-based cryptography by supplying a precise definition of the security of this approach, and providing compelling new applications for it. Congrats to the award recipients. Anna and I are running a three-week, intensive, first-year course in which the students use Uppaal to make models of computing systems and games, and to analyze them using the verification capabilities of that excellent tool. The students find it very easy to use the tool, and can start solving modelling and verification problems with it in a jiffy. One of the groups of students taking the course delivered a neat video with their solution to one of the problems we posed them. It is the first time I ever received a video as part of a student report. I expect that this will be the first of many. The leadership of the EATCS has decided to decouple the production of the Bulletin of the EATCS (BEATCS) from its editorship. Starting from the October 2013 issue, the BEATCS will be produced, printed and shipped by our Secretary Office in Greece. We think that this change was overdue, and that it will help us improve both the production and the scientific quality of the BEATCS. From the October 2013 issue, the editor in chief of the BEATCS will focus solely on the scientific content of the Bulletin. Our colleague Maria Serna has served as editor in chief of the BEATCS for a long time and has many other commitments. Therefore, we feel that the time has come to appoint a new editor, whose job will be to continue improving the quality and the impact of the Bulletin, in cooperation with the Council of the EATCS and following on Maria's footsteps. We hereby ask you for expressions of interest to the role of editor in chief of the BEATCS. Each expression of interest for the position should be accompanied by a couple of paragraphs describing your vision for the future of the BEATCS. You are also most welcome to propose suitable candidates for the position other than yourselves. Please send your nominations to me via email by the 30th of April at the latest. I take this opportunity to offer Maria Serna our heartfelt thanks, on behalf of the EATCS, for all the work that she has done over the years as editor in chief of the Bulletin. We really appreciate the effort she has put into this important service to the EATCS and the TCS community as a whole. 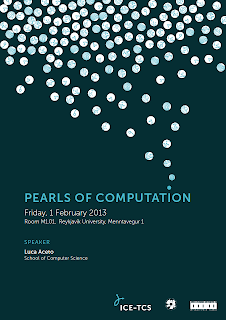 Season one of the new Pearls of Computation seminar series at Reykjavik University is in full swing. On Friday, 15 February 2013, my ICE-TCS colleague Eyjólfur Ingi Ásgeirsson (School of Science and Engineering, Reykjavik University) delivered a talk on E.W. Dijkstra entitled The shortest path to beautiful code ( - DEATH TO GOTO - ). Recording of the talk (slides and audio) in .avi format. An Interview With Edsger W. Dijkstra by Thomas J. Misa, Communications of the ACM, Vol. 53 No. 8, Pages 41-47. K.R. Apt, Edsger Wybe Dijkstra (1930 -- 2002): A Portrait of a Genius. Formal Aspects of Computing, 14, pp. 92-98, 2002. The following talk was held on Friday, 5 April 2013, when Kristinn R. Thorisson (School of Computer Science, Reykjavik University) delivered a presentation on the work of Marvin Minsky entitled Marvin Minsky: Pioneer, Critic, Optimist. Recording of the talk (slides and audio) in .mp4 format. Human Interface video played by Kristinn during the talk. NOVA Interview with Marvin Minsky. Track A: Mark Bun and Justin Thaler. Dual Lower Bounds for Approximate Degree and Markov-Bernstein Inequalities. Track B: John Fearnley and Marcin Jurdziński. Reachability in Two-Clock Timed Automata is PSPACE-complete. Track C: Dariusz Dereniowski, Yann Disser, Adrian Kosowski, Dominik Pajak and Przemysław Uznański. Fast Collaborative Graph Exploration. Track A: Radu Curticapean. Counting matchings of size k is #W-hard. Track B: Nicolas Basset. A maximal entropy stochastic process for a timed automaton. None of the accepted papers for Track C was a student paper. Congratulations to all the recipients of the best paper awards! 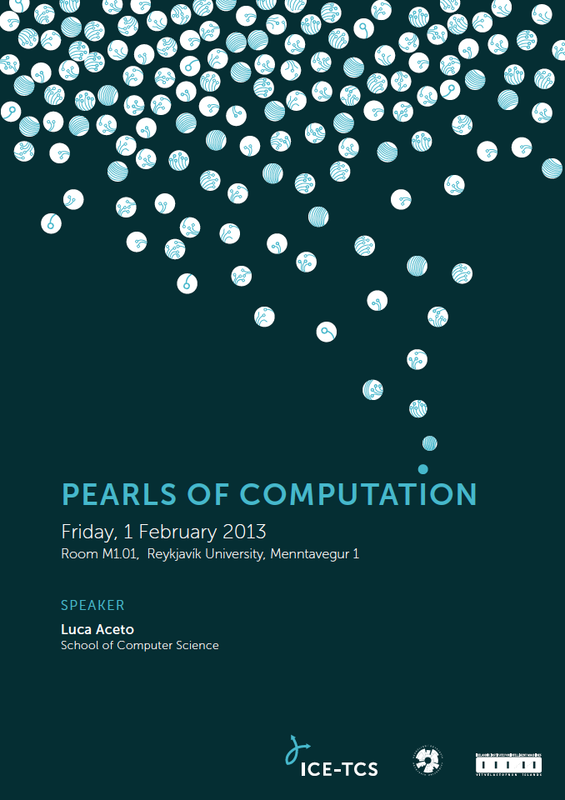 I look forward to listening to their talks at ICALP 2013. The list of accepted papers for ICALP 2013 is now available (with and without abstracts). ICALP 2013 is the 40th ICALP conference. I hope to see many of you in Riga to celebrate this event. The School of Computer Science at Reykjavik University seeks to hire a faculty member for a new academic position in the field of interactive narrative and game design. We are interested in an ambitious, highly qualified academic who can combine innovative teaching and cutting-­edge research in the rapidly evolving area of interactive digital entertainment within our school. The faculty position is funded through a collaboration with massively multiplayer game developer CCP Games Inc. We are particularly interested in active researchers who see opportunities in breaking new ground with CCP and with existing faculty within Reykjavík University, in particular within CADIA, the school's artificial intelligence research center. CCP will fund the faculty position for a minimum of 5 years; following that period, CCP and Reykjavík University will seek continued funding for the position. Full academic freedom is respected, however, by both CCP and Reykjavík University. See here for more information. The application deadline is 30 April 2013 and interviews will be held in May 2013. This is not news anymore, but the list of accepted papers for LICS 2013 is available here. For what it is worth, here are two papers that immediately caught my attention browsing through the list of accepted papers and that are available on line. Dexter Kozen, Kim Guldstrand Larsen, Radu Mardare and Prakash Panangaden. Stone Duality for Markov Processes. Mikołaj Bojańczyk, Bartek Klin, Sławomir Lasota and Szymon Toruńczyk. Turing Machines with Atoms. To whet your appetite, here is what is probably the main result in the latter paper. Theorem: In sets with equality atoms, there is a language that is decidable in nondeterministic polynomial time, but not deterministically semi-decidable. Before you get carried away, here is what the authors write below the statement of this theorem. A consequence of the theorem is that, with atoms, P is not equal to NP. It is not our intention to play up the significance of this result. In a sense, the theorem is too strong for its own good: it shows that computation with atoms is so different from computation without atoms, that results on the power of nondeterminism in the presence of atoms are unlikely to shed new light on the power of nondeterminism without atoms. Congratulations to all the authors of accepted papers. Happy Easter news for the TCS community. Samson Abramsky is being awarded the British Computer Society (BCS) Lovelace Medal for 2013. (The press release is here.) The BCS Lovelace Medal was established in 1998 in honour of Lady Augusta Ada Byron, Countess of Lovelace and daughter of Lord Byron. The Medal is presented annually to individuals who, in the opinion of BCS, have made a significant contribution to the advancement of Information Systems. It is particularly pleasing that this award recognizes work of a highly foundational character, and shows the commitment of BCS to support the study of computing not only for its manifold applications, but as a fundamental scientific discipline in its own right. is pre-eminent in setting the modern agenda in the foundations of computer science, an area where he has made immense contributions since the 1980s. His contributions in each of the past three decades had a major impact on the field, notably: Domain Theory in Logical Form, Game Semantics and Categorical Quantum Mechanics. He has shown the ability to change research fields and to establish new interdisciplinary approaches. His work over the past decade has shown that methods and concepts developed in theoretical computer science can be applied very directly in quantum information, and the foundations of quantum mechanics itself. Another recent example of application of methods from "volume B TCS" to other fields is in this short paper, where Samson and Wiktor Winschel apply coalgebraic and other structural methods originating from computer science to economics and game theory. 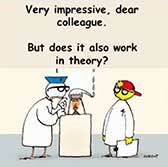 Does it also work in theory? Courtesy of Robbert Dijkgraaf's media page. The following piece of text has been going through my head since the meeting of an award committee I attended earlier this week. I had to get rid of it by writing it down. So here it is, for your reading pleasure. I thought that it was best to choose a "How to have your abstract rejected" style for this piece. You have just seen the call for nominations for an award and you have an excellent candidate for this accolade in mind. The call for nominations asks for a letter of nomination and gives some criteria that a nominee for the award should satisfy. How can you increase the chances that your nomination will be unsuccessful? The aim of this short piece is to present some simple approaches that are guaranteed to increase the chances that your nomination will be unsuccessful, even if you were nominating Albert Einstein for the Relativity Award 2013. The first step in ensuring lack of success of a nomination is not to read the guidelines in the call for nominations. This will make it highly likely that your letter will not address at least some of the criteria that a good nomination should have. However, this leaves open the possibility that, by chance, your letter of nomination address some of the most important criteria for nominating your candidate. The best approach to prevent this from happening is to be systematic. Do read the call for nominations and make sure that you avoid addressing each of the criteria listed there. For example, if the call asks for (a link to) a CV, do not provide any! that you are not willing to invest any time and effort in finding out why the nominee is worthy of the honour and in convincing the committee that (s)he is the one to select. Is there a better way of achieving your goal? If so, I should really like to know. I am enjoying reading Out of Their Minds (The Lives and Discoveries of 15 Great Computer Scientists) by Dennis Shasha and Cathy Lazere. IMHO, the book does a great job in making the lives and ideas of some of the leaders in our field accessible to a general public. I will recommend it to my students and to the colleagues of mine who will prepare future Pearls of Computation seminars. I do one thing at a time. This is what computer scientists call batch processing---the alternative is swapping in and out. I do not swap in and out. This quote reminded me a TED talk, in which Italian designer Paolo Cardini encourages his audience to consider the virtues of monotasking. For several years in my career, I was largely a monotasking person. In my research, I mostly worked on one thing at the time. However, this has changed substantially over the years. Now I find myself multitasking and context switching a lot and this leads to more stress at work. I guess that most of us have a similar story to tell; the length of the list of things to do increases much faster than our ability to get things done, alas. Stephen Cook has received Canada's highest honour, the Gerhard Herzberg Canada Gold Medal for Science and Engineering. More on Stephen Cook's Herzberg Canada Gold Medal can be found here. (4) - complexity of counting constraint satisfaction problems. In addition, the laudatio singles out his work with Alan Frieze on developing the probabilistic analysis of algorithms. Dyer and Frieze showed that many NP-hard problems arising in combinatorial optimisation can be solved in polynomial expected time when the instances are drawn from natural distributions. The Presburger Award Committee, consisting of Peter Widmayer, Antonin Kucera and Monika Henzinger (chair), has unanimously decided to propose Erik Demaine (MIT, USA) as recipient of the 2013 EATCS Presburger Award for young scientists. Congratulations to Erik! The Presburger Award is sponsored by CWI, Centrum Wiskunde & Informatica. The citation for the award reads as follows. Addendum, 14 February 2013: Check out a Popular Science article on Erik's work here: http://www.popsci.com/science/article/2013-01/dazzling-sometimes-absurd-always-playful-genius-erik-demaine. The poster has been designed by the talented team at Podpunkt. In case you need a good design for book covers, logos or posters, you might wish to consider them. Look at their portfolio and enjoy their work. As I remarked in an earlier post, the Podpunkt studio has strong connections with mathematics and TCS.